Airstrike is a 2d dogfighting game being slowly developed by various people around the net. It is not yet playable although there is an old version which may be a bit fun to try. We are developing the game using only freely available tools, and we try to do everything ourselves. 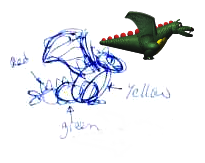 The source code and the 3d models are released under the GPL licence. Features include alpha blended raytraced graphics and accurate physics. We are working on making it fun to play; all help is welcome. The picture on the left is a part of a screenshot from the game. Subversion repository and development Wiki can be found here. The wiki is the preferred form for planning development. Please note that this is a old version, and the game has changed a lot in recent times. This is however the latest playable version. Discussion about the game is usually held on the mailing list at airstrike@icculus.org (send a blank email to airstrike-subscribe@icculus.org to subscribe), or on irc at #airstrike on irc.freenode.net. The main author can be reached at uekstrom AT gmail.com.